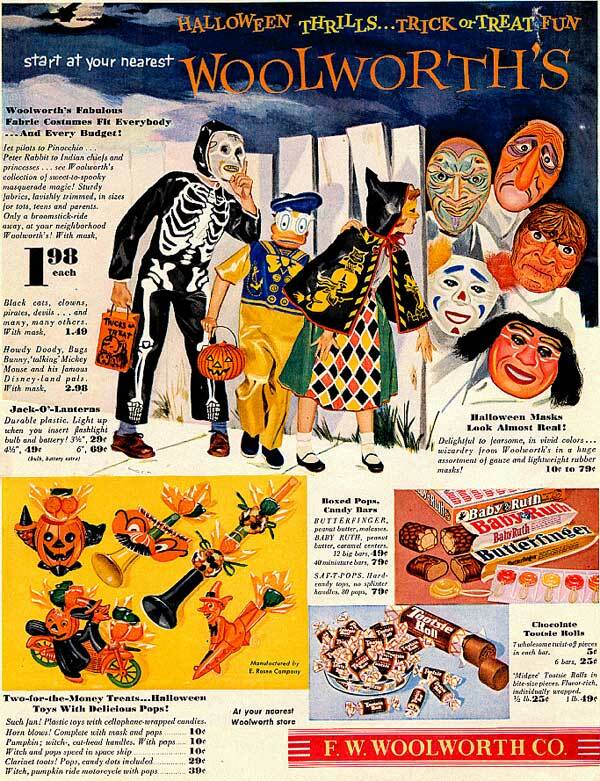 It’s funny; when I look back at my personal Halloween memories there aren’t many that reflect the actual act of trick-or-treating. 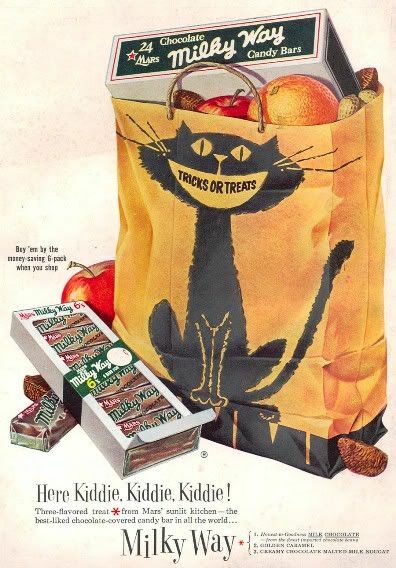 There are a couple, sure – one year some big kids stole my haul, an actual pillowcase full of candy, so technically a trick-or-treat memory but one I’d rather skip – but by and large my Halloween memories are of the on-ramp to the holiday itself. 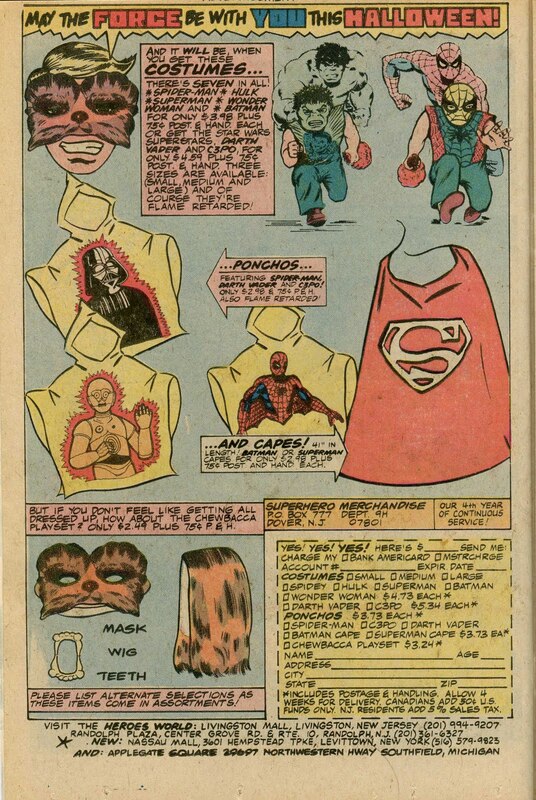 I remember the smells of plastic too-tight masks combined with the multi-week off-gassing of the vinyl tunics that served as the “clothes” part of the costume. I remember the spooky sound effects tapes coming out of the neighbor’s garage down the street on October 15th as he got his elaborate setup ready for the big night. 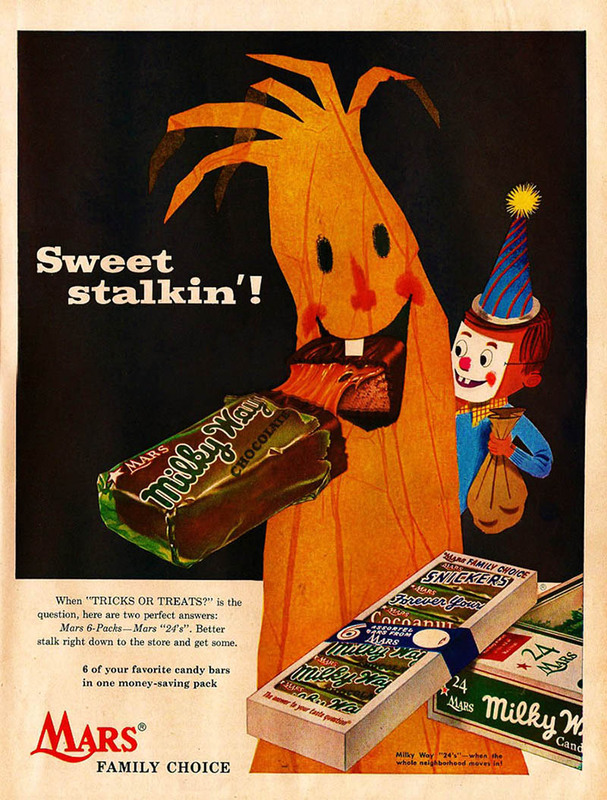 I remember pumpkin-shaped Happy Meal buckets, church-and-school ‘safe zone’ Halloween parties with public domain music and cake walks, and super scary warnings about razor blade and LSD-ridden candy. And in between all of this, the ads. 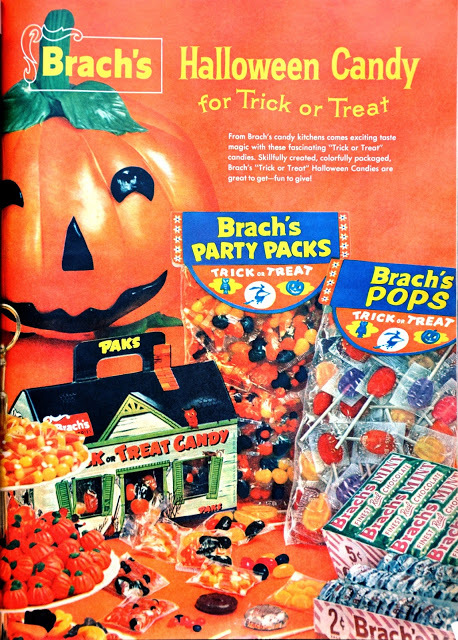 Print and television were overrun with Halloween products or Halloween spins on evergreen products, aimed at children and adults alike. 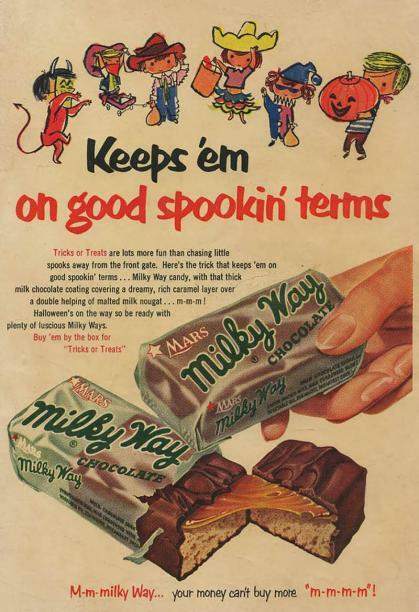 These ads were and still are the wallpaper of the Halloween season, and things wouldn’t be the same without them. 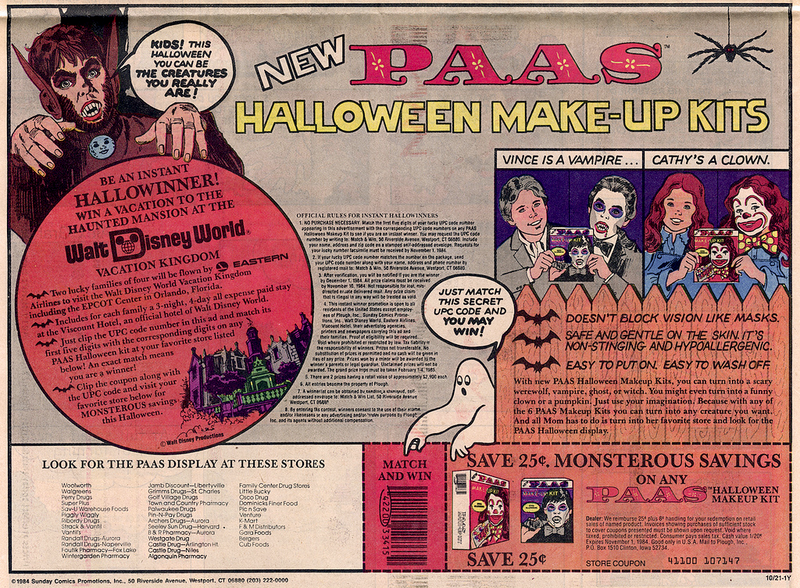 Here are some that either really scratch my design itch or conjure up specific sense memories of Halloweens gone by. When you’re pitching your product as breakfast OR candy, it’s hard to argue that your food has any level of “wholesome”-ness. 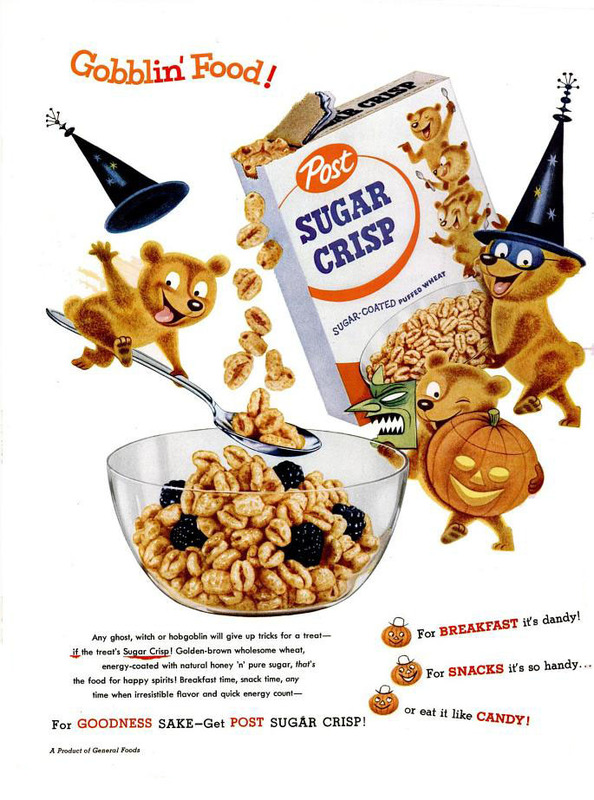 Sugar Crisp was probably responsible for more dental bills than any Trick-or-Treat haul. Still, all of the white space in this design and the soft design of the bears really make the cereal come through as…well, crisp. 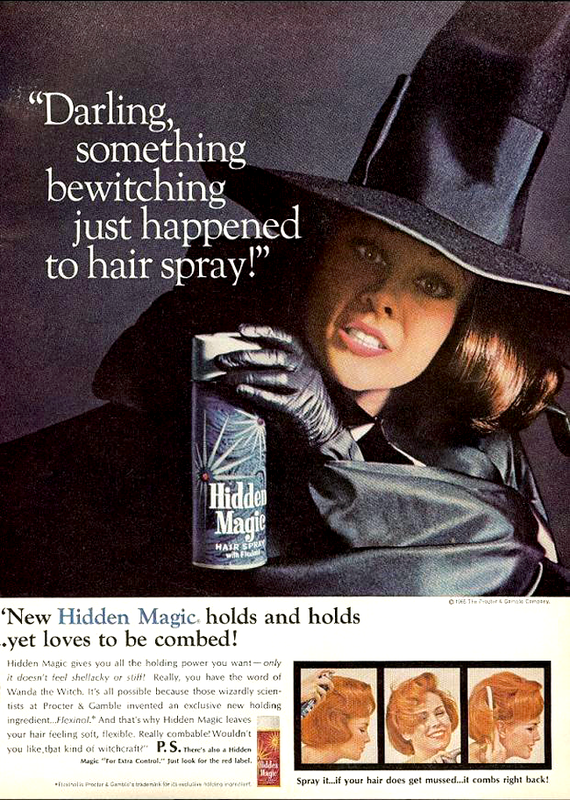 Here are a few other ads from the ’50s and ’60s, mostly aimed at grownups. Sugar Crisp might as well be vitamins compared to some of these products. 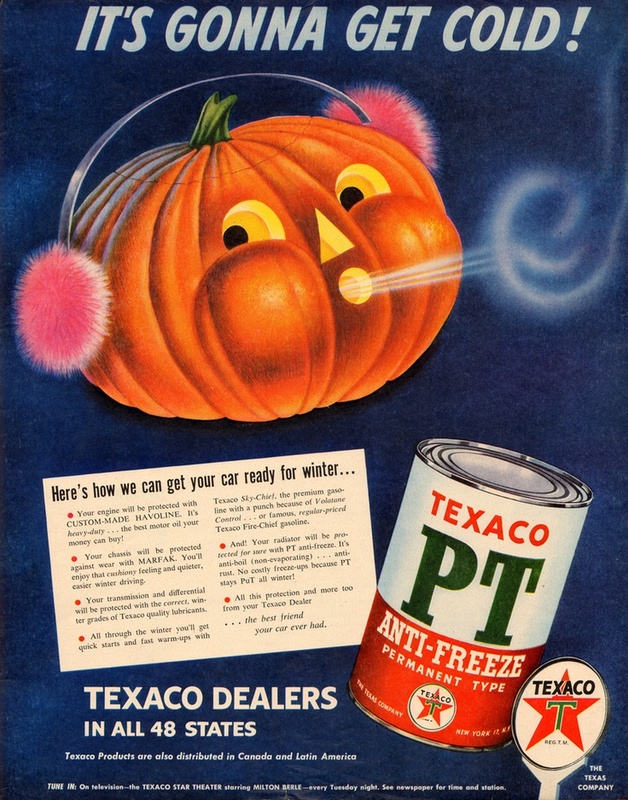 Nothing says Halloween like…cigarettes. The look in this lady’s eye really speaks to the madness of nicotine addiction. 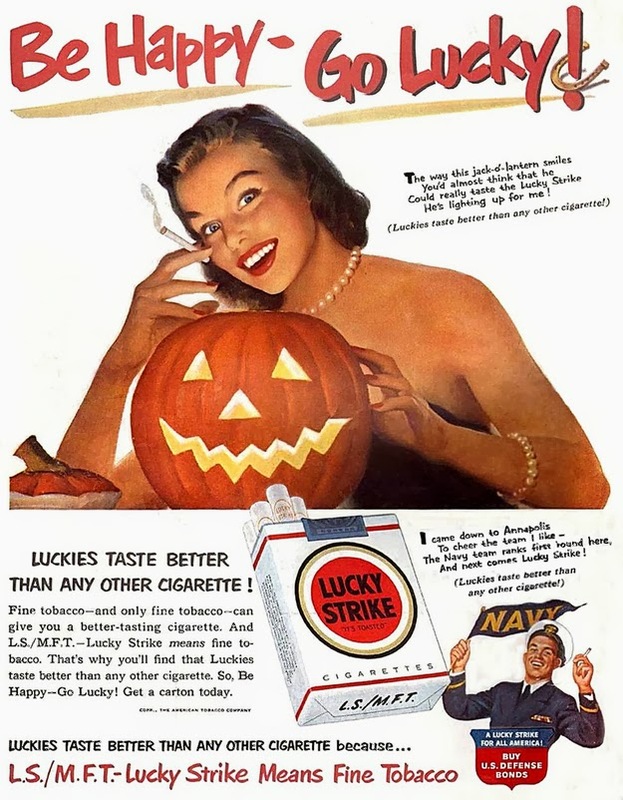 It’s also worth noting how the line “Luckies Taste Better Than Any Other Cigarette” is shoehorned into every other piece of copy, sometimes placed in parentheses like some ad man standing directly behind you whispering it into your ear. What’s scarier than a hole in the ozone? 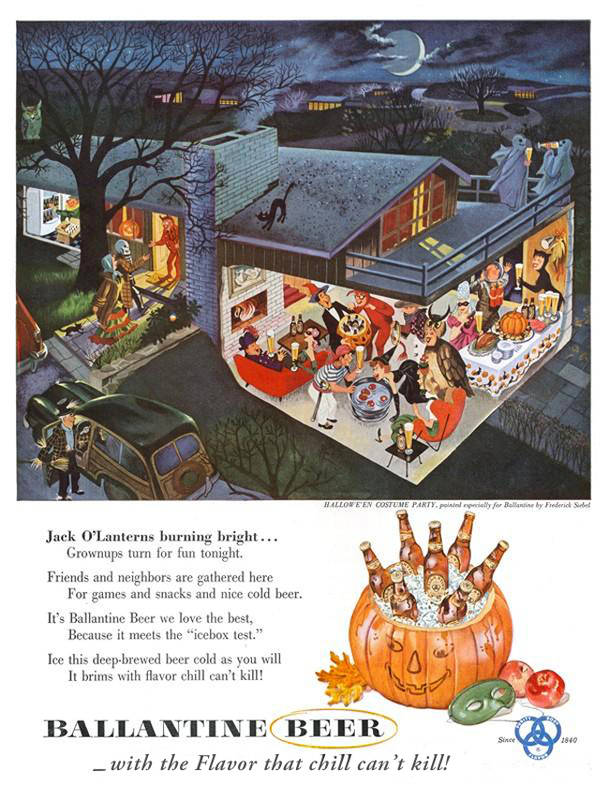 It’s not like an adult Halloween party is a new concept, but it’s neat to see it represented here in this Ballantine ad. Hard to believe that we used to be a society that didn’t want our beer to be cold. 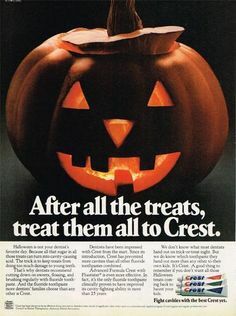 I mean, you’ve got an ad buy for October, cold weather’s coming, why not just put a jack-o-lantern in your ad with no other holiday context? 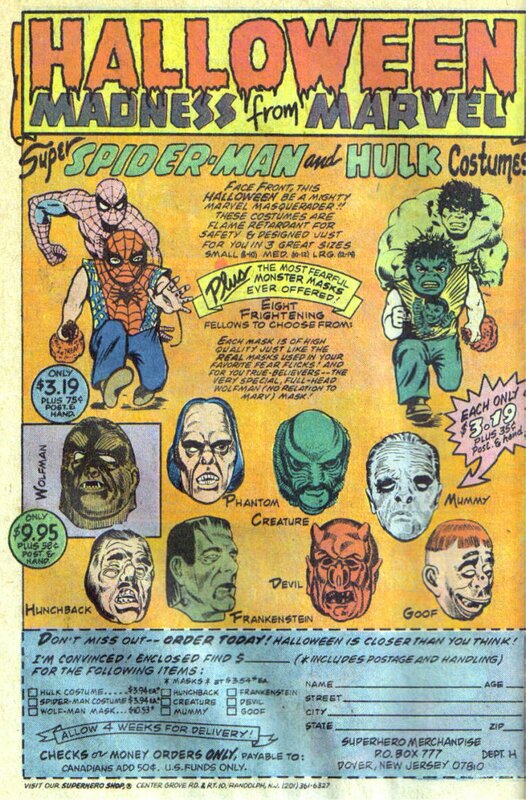 I love the drawings of the kids in their costumes on this ad so much. 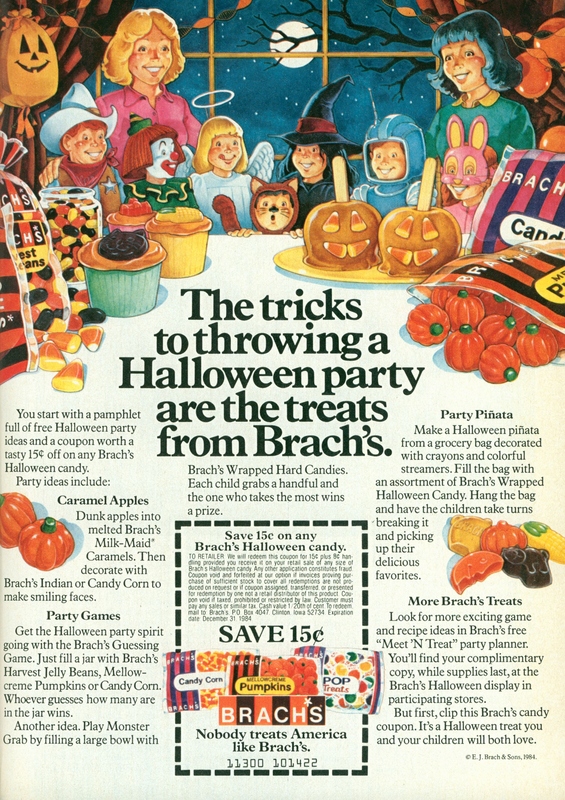 Brach’s is kind of the quiet champion of the season; the company doesn’t really do a ton of glitzy marketing but they’re always well represented in any Trick-or-Treat haul. 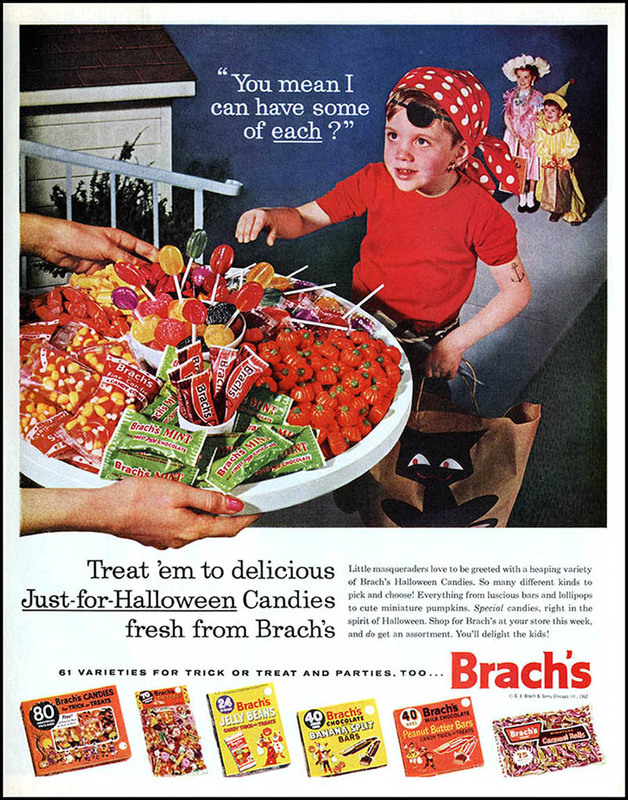 As long as there’s grandparents and waiting rooms and some small segment of the world that has a taste for candy corn, Brach’s isn’t going anywhere. While they may not have a huge ad presence, what ads they do have are impressive. I can smell this plastic pumpkin, can’t you? 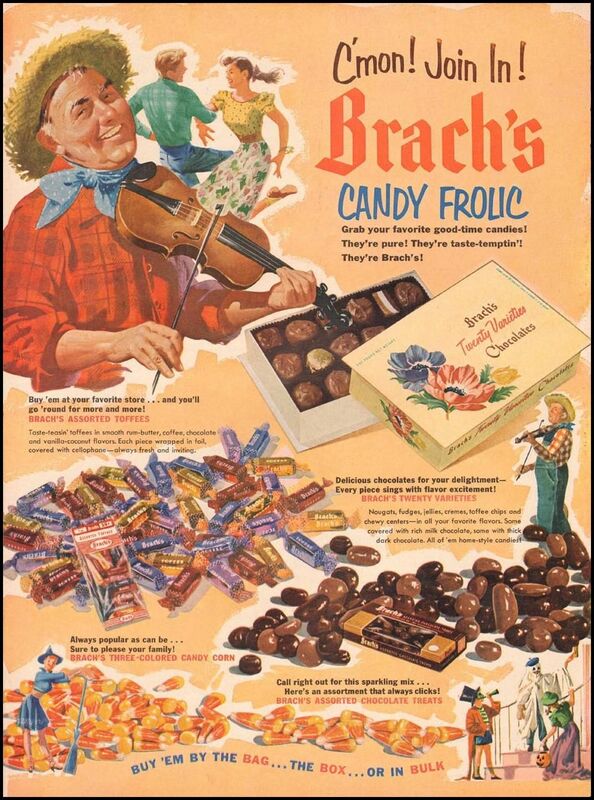 I’m not sure who is responsible for “frolic” leaving our shared lexicon, but that let’s get whoever that is a medal. The artwork, the font, and the bottom half wall of text scream “80’s magazine ad” on this one, and I’m here for it. That poor kid in the baggy clown costume. What’s the over/under on number of times he tripped over his own pants that night? 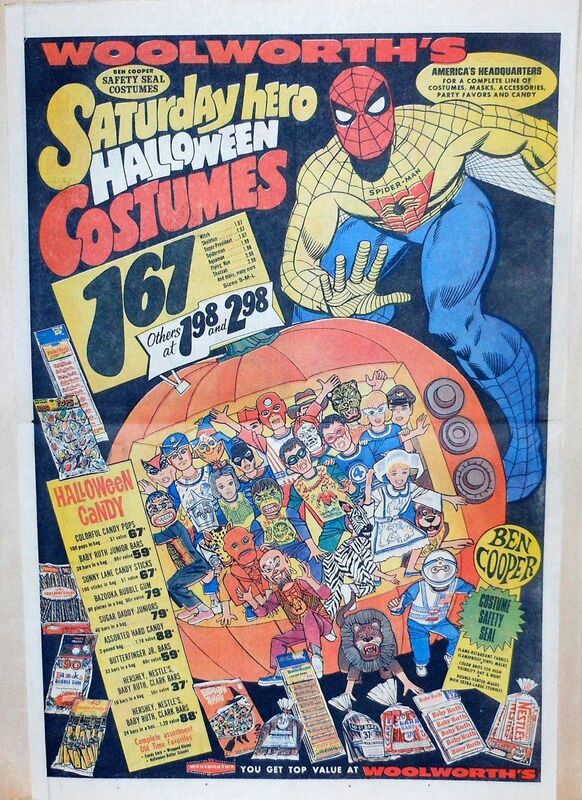 I’ll wrap things up with what are personally the most memorable yet likely the most disposable of Halloween ads, the department store/comic book flyers. The Richard Scarry books of advertisements, I’d spend an embarrassing amount of time scanning up and down, left and right, across everything these stores had to offer. I probably got way more time out of them than was put into making them. Happy Halloween, everybody. See you in the Dentist’s waiting room on November 1st.